If you suffer a slip and fall in a Nevada store, you may have a valid legal claim against that business depending on the circumstances. This is because establishments that welcome the general public into their premises owe a legal duty to keep those individuals reasonably safe from harm. In other words, it need not matter if the establishment is a big box chain, another regional chain, or a mom-and-pop store; that business is obligated to take certain measures to keep their customers out of harm’s way. While a person who is hurt in Nevada in a slip and fall accident may have a valid legal claim, this does not mean the case will be easy. The store must have been negligent or committed some wrongful act. Negligence is established by showing the store breached its duty owed to keep the premises safe and this breach was the actual and legal cause of the accident, which resulted in harm. A store may be held liable if it created the unsafe condition or knew, or should have known, about the unsafe condition even if it did not create it and failed to take steps to remedy it. An injured victim will need to demonstrate that the unsafe condition was not so open and obvious that he or she should have taken steps to avoid it. Said differently, a customer must exercise reasonable caution to protect him or herself. Nevada law requires that a person injured due to a slip and fall must file the lawsuit against the at-fault property owner within two years of the accident. This same time frame applies in those cases in which a slip and fall accident causes the victim’s death and their surviving family members or a representative of the deceased’s estate wants to bring a wrongful death claim. In wrongful death cases, however, the two-year clock starts running on the date of the victim’s death which may or may not be on the date of the actual accident. When property damage is involved in a slip and fall, any lawsuit must be filed within three years of the accident to recover property damage (this does not lengthen the time of an injury statute). If you fail to file a lawsuit within these time frames and try to proceed to court outside of the statute of limitations, your case will be dismissed. 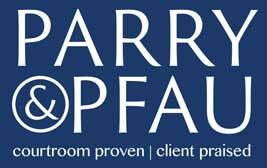 If you or someone you know has been hurt in a Nevada slip and fall due to the negligence of a business, contact the skilled personal injury attorneys at Parry & Pfau , who have years of experience representing the injured across the state of Nevada. Contact them today to learn about your rights and obligations under the law. In order for an injured victim to succeed in a slip and fall claim against an enterprise, he or she must establish negligence. Slip and fall personal injury cases can be complicated, and things get even trickier if your injuries occurred on government-owned property, such as a public library, a federal park, or on the grounds of a government building. Often times before someone can receive compensation for injuries suffered in an accident they must file an insurance claim. This task is intimidating to some, but is in fact, a straightforward process if you have an attorney. Newer PostIs it Legal to Carry a Knife in Nevada?